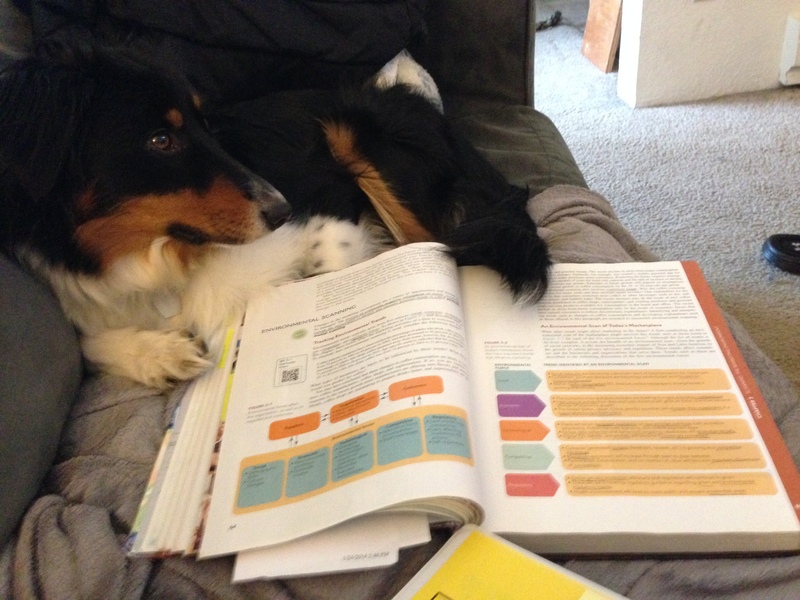 Sophie helps me with my marketing homework…. or at least she makes me feel better about it! More about Sophie here. One of Sophie’s hugs. She’ll even rest her chin on our shoulders. I’m thankful for Sophie’s enthusiasm – it always brightens my day! What quirky things make your pet happy? For every five wonderful, uplifting experiences you have at the dog park, you’re bound to have a stressful, agitating one. We had one of those not-so-wonderful experiences the other day. Sophie was quivering and howling with excitement for us to let her loose in the dog park. We let her acclimate and calm down a little bit in the “holding cell.” When we finally opened the gate she joyously bolted across the park, weaving around the other dogs. Typically Sophie is the fastest dog in the park. She loves it. The other dogs chase her but they don’t come close to catching her. This time, one spotted dog was able to corner Sophie. Usually this would lead to some good-natured playing until Sophie runs off again. But for some reason, the two dogs had a very snarly exchange that caused Sophie to run back to Riel (her alpha) for protection. The spotted dog came after Sophie. She seemed intent on asserting herself over Sophie. Riel was brushed by some teeth as he separated the dogs. The silver lining in this whole scenario was Cody. Cody is a six-year-old Husky. He and his human have been at the dog park every time we’ve come. Cody is laid back and he doesn’t interact a lot with the other dogs, but they all seem to know that the park belongs to him. When the spotted dog came back and tried to get to Sophie, Cody placed himself resolutely between them. He did not growl, or even bare his teeth, but his presence certainly deterred the spotted dog from trying to get to Sophie. I love how their tails are wrapped together. It’s a great representation of how calm, cool, and collected Cody is! I want to be clear that just because the spotted dog had a problem with Sophie doesn’t mean that she is a bad dog. We aren’t sure whether Sophie did something to incite the spotted dog’s behavior (we don’t think so – but we have an obvious bias). Also, the spotted dog was perfectly well behaved toward Riel and I and her owner was very kind and responsible. Like I said, for every 5 great days at the dog park, there’s bound to be one crappy day. 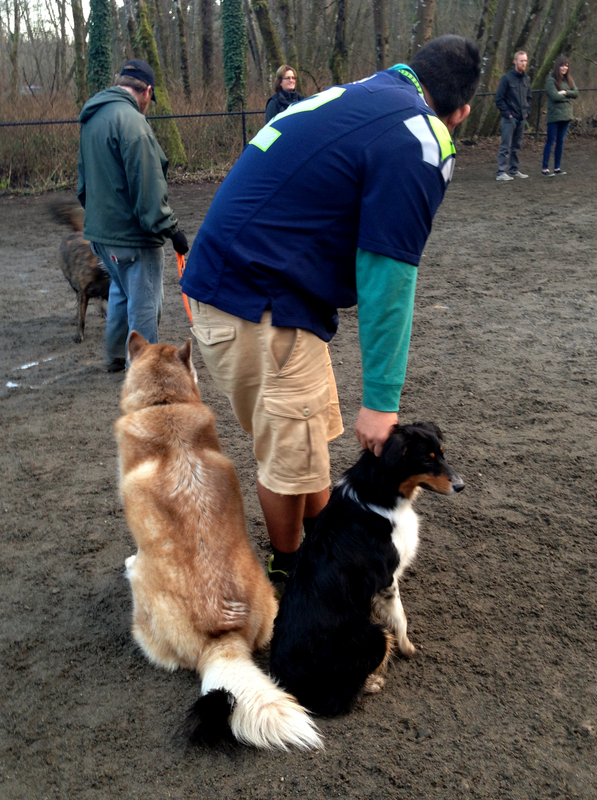 Have you had any out-of-the-ordinary experiences at the dog park? Every kid wants a puppy (or a pony) for Christmas. For Christmas 2012, Riel and I decided to get ourselves a Christmas puppy. 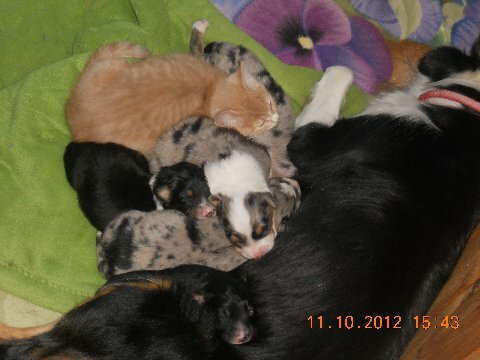 We fell in love with a litter of Miniature Australian Shepherd puppies that were born on Halloween. 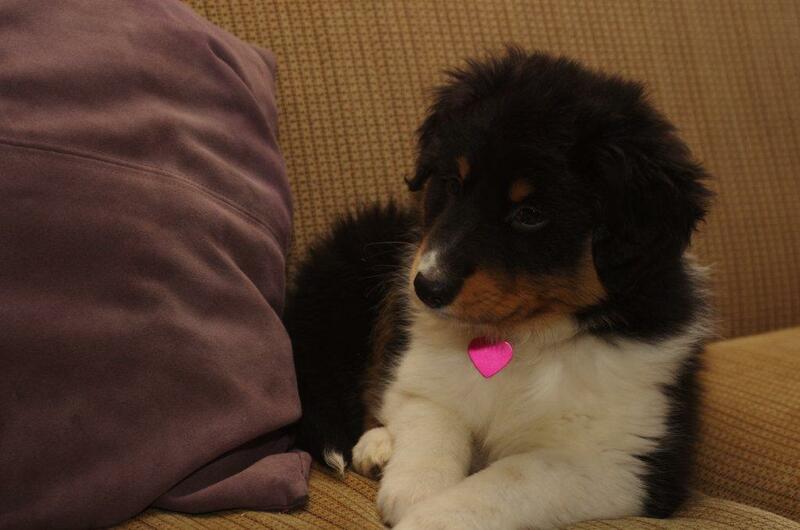 I grew up with an Aussie/Border Collie mix named Sadie and pretty much can’t resist those breeds. 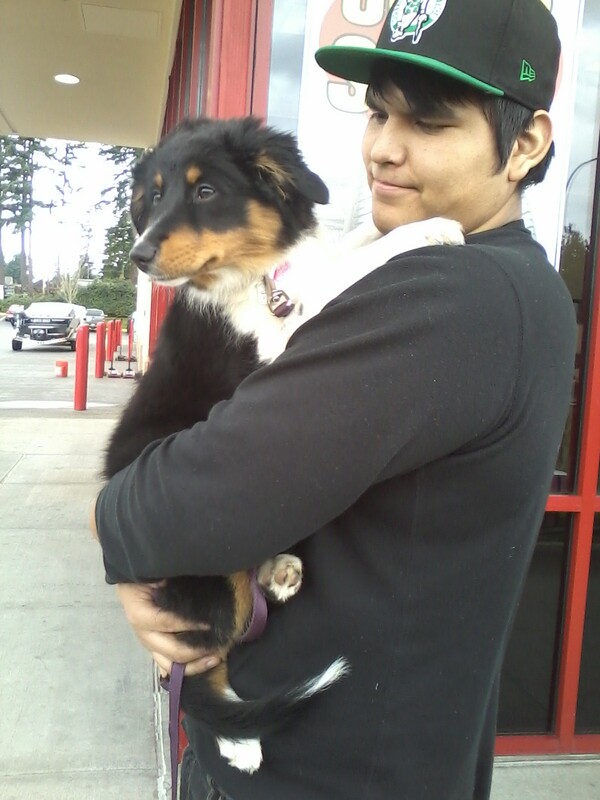 We drove 2 hours to examine the pups and potentially choose one. We narrowed down our choice between two tri-color female pups that had sweet temperaments (we thought – hard to tell since their eyes weren’t open!) and were almost identical. Riel picked Sophie because of her white collar markings. She looked like a little cow/mouse hybrid. We paid way too much for Sophie. I mean technically. 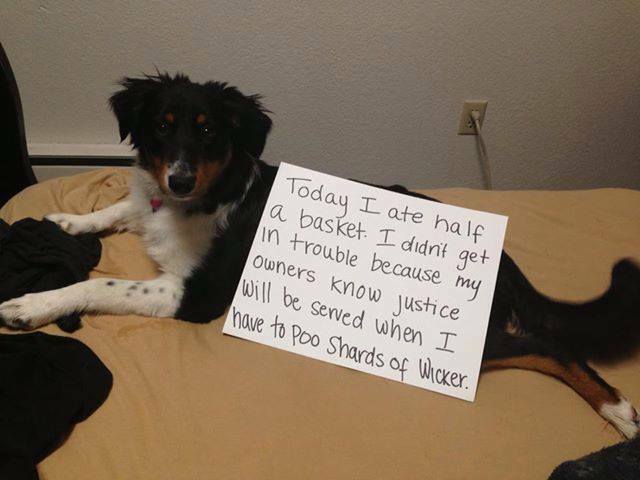 The owner claimed that she was pure-bred. We met the mother and saw pictures of the father – who both seemed pure-bred. Sophie didn’t come with any papers, but we were in love with her. We paid the ridiculous price and brought her home on Christmas Eve. Riel gave Sophie her first French fry in the car on the way home. Now, Sophie is a part of the family. 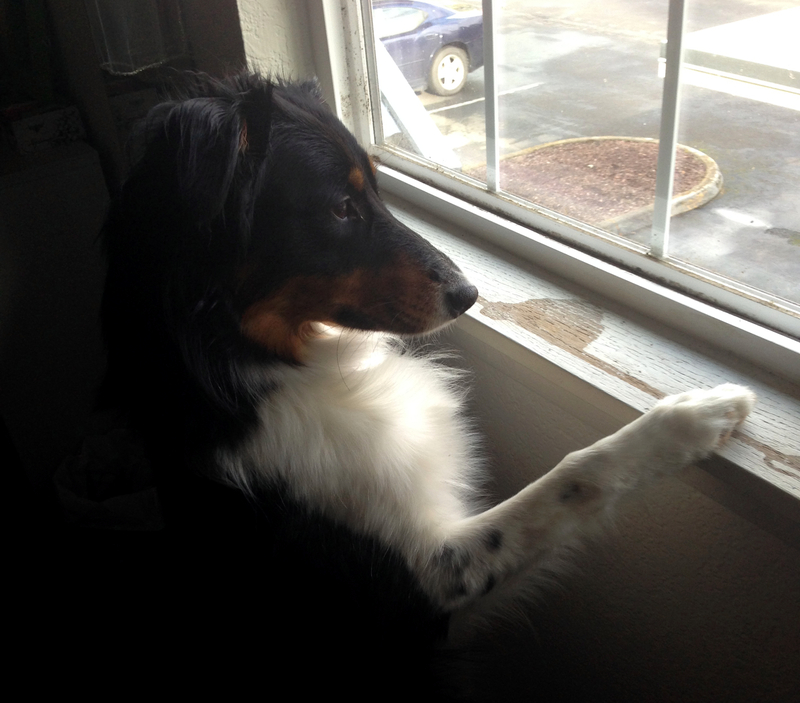 She has gotten into a lot of trouble, which is to be expected for a high-energy Aussie in an apartment, but she has also helped to make our apartment a home (see some other ways we make apartment living work for us). How did you meet your furry friends? Enter your email address to follow Haphazardly Ever After and be the first to see new posts via email notification!